I was just diagnosed with a desmoid tumor. What do I do now? What is a desmoid tumor? Is it cancer? Is it sarcoma? Can my desmoid tumor be passed down to my children? How do I know if my desmoid is going to be cured? I have a desmoid tumor. Can I get pregnant? 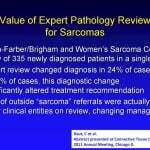 Why is it so important to be seen by a sarcoma specialist upon being diagnosed with a desmoid tumor? Are desmoid tumors considered cancer? What is the modality of choice for imaging desmoid tumors? On T1WI, fat is bright (high signal) and fluid and muscle are dark (low signal). On T2WI, fluid is very bright and fat and muscle are dark. Desmoid tumors are generally low in signal on T1WI but can be either high or low in signal on T2FS, depending on their composition. Desmoid tumors are composed mostly of cells called fibroblasts and the collagen which they produce. Early in the course of their evolution, desmoid tumors contain a high percentage of fibroblasts; in this state they are referred to as “cellular” desmoids. Over time, the number of fibroblasts within a desmoid tumor decreases while the relative proportion of collagen increases. Late in the course of their lifecycle, desmoid tumors often achieve a state in which they are composed mostly of collagen with relatively few fibroblasts, at which point they can be referred to as “collagenous” or “collagen-predominant” desmoid tumors.1 Because fibroblasts are high in water content, they are bright on T2WI; in contrast, collagen has relatively low water content and therefore, is dark on T2WI.2 Since desmoid tumors are mostly cellular early in the course of their lifecycle, they are predominantly high in T2 signal, frequently intermixed with linear bands of low T2 signal collagen; these “bands” of low T2 signal are highly characteristic of early desmoid tumors, and serve as a clue to the radiologist when the diagnosis is not previously known.3 As they mature, the degree of cellularity decreases with a concomitant decrease in the percentage of high T2 signal. Eventually, desmoid tumors become almost entirely dark on T2WI, indicating that the tumor is mostly collagenous and unlikely to grow significantly in the future. Contrast enhanced images of desmoid tumors appear similar to the T2WI in that the cellular tumors are high in signal (avidly enhancing) and the collagen-predominant tumors are much lower in signal (only mildly enhancing). T1WI without contrast are also used in the standard imaging protocol: Both cellular and collagen-predominant tumors are low in T1 signal, although the collagenous tumors are extremely dark. However, the purpose of the T1WI is not to evaluate the ­­degree of cellularity of desmoid tumors, but rather to evaluate the relationship of these tumors with surrounding structures, such as bone, blood vessels and nerves. While most desmoid tumors will eventually become less cellular over time, the rate at which this change occurs is unpredictable. The goal of medical therapy is to hasten this process, particularly in patients who are symptomatic. Medical therapy can cause desmoid tumors to decrease in both size and cellularity; however, even in the absence of a noticeable size decrease, a decrease in the degree of celluarlity alone is often associated with improvement in symptoms. The most common drugs used to treat desmoid tumors are Sorafenib, Doxorubicin, Methotrexate and Tamoxifin. MRI is the modality of choice for imaging desmoid tumors. MRI has superior soft tissue contrast compared to CT; in other words, desmoid tumors are easier to see on MRI against a background of other soft tissues such as muscle (on CT, muscle and desmoid tumors have a similar density, and therefore, can be difficult to distinguish from each other). In addition, MRI is capable of assessing the degree of celluarity (high T2 signal), which is beneficial for determining treatment response – CT is less accurate in determining the degree of desmoid tumor cellurity. Another major advantage of MRI over CT is that lack of ionizing radiation associated with MRI. CT, unlike MRI, uses a complex array of x-rays to generate an image. X-rays are a form of ionizing radiation, and ionizing radiation has carcinogenic potential. The average radiation dose of a single CT scan is approximately 10 millisievert, which is about three times the annual radiation exposure for the average person living in the United States (mostly from sources such as cosmic radiation, airborne radon, medical procedures, commercial and industrial exposure, etc. ).4 It has been estimated that this dose of radiation from a single CT scan is associated with a 1/1000 (0.1%) increased risk of developing cancer. This risk is cumulative, so that a person who receives 5 CT scans over a period of months or years, has a 5/1000 increased risk of developing cancer (a 0.5% increased risk of getting cancer in addition to the patient’s baseline risk). Given this small, but real risk, it is prudent to weight the risks versus benefits when imaging patients with multiple CTs. MRI is often a viable alternative in patients who require repeated imaging for surveillance of desmoid tumors. Furthermore, the IV contrast used with MRI (gadolinium) has less renal toxicity and is associated with fewer allergic reactions than the iodinated contrast used with CT. Even for patients with severely compromised renal function, who cannot receive intravenous contrast of any kind, high quality MR images can still be obtained without contrast. On the contrary, CT imaging of soft tissue tumors without intravenous contrast is often significantly compromised. CT does have several advantages over MRI. For example, some patients are claustrophobic and cannot tolerate lying inside the relatively narrow bore of the MRI magnetic for the entire exam, which typically lasts at least 30 minutes (Valium can be given to help alleviate this problem). CT scanners are much less constricting and are associated with much shorter imaging times (only a few minutes). Certain metallic devices are incompatible with the strong magnetic fields used for MRI: These include pacemakers, cochlear implants and certain older aneurysm clips. Metallic foreign bodies near the orbit are also contraindicated. Patients who have these devices need to be imaged with CT instead of MRI. While MRI is clearly the modality of choice for imaging extra-abdominal (including abdominal wall) desmoid tumors, many radiologists prefer contrast enhanced CT scans over MRI for evaluating intra-abdominal desmoid tumors, especially when these tumors are located in the mesentery. CT images are much less sensitive to the motion associated with bowel peristalsis and diaphragmatic excursion during respiration, and can more easily distinguish desmoids from adjacent mesenteric fat or fluid filled bowel loops, which can appear similar to desmoid tumors on the T2WI used in MRI. RECIST (Response Evaluation Criteria in Solid Tumors) is a commonly used method to measure tumor size: It is the simplest of all the methods, requiring a one-dimensional measurement of the longest axis of the tumor. The WHO (World Health Organization) criterion is a two-dimensional method which measures the longest axis of the tumor and the greatest perpendicular measurement. This method is somewhat more accurate than RECIST for measuring desmoid tumors, because desmoid tumors often shrink more in the short axis than the long axis – the short axis is not measured in RECIST. In such cases, WHO will more accurately reflect therapeutic response. Three-dimensional measurements are also commonly used and are only slightly more time-consuming. Finally, volumetric measurements (measuring the area of the entire tumor on each slice and multiplying the sums of these measurements by the slice thickness), if performed properly, are the most accurate method for measuring tumor size, but are by far more time-consuming than any of the other methods. Given that this method is so labor intensive, studies are currently being conducted to determine if the added accuracy of this method adds enough clinical value to warrant its use. Other studies are being conducted with software in an attempt to measure tumor volume in an automated fashion. Whichever method is utilized to measure tumor size, it is important that the measurements are conducted by a radiologist who has experience with desmoid tumors in order to properly distinguish tumor from adjacent normal tissue and to recognize the significance of T2 signal changes. Equally important, is consistency between measurements – different radiologists will often measure the same tumor differently (inter-observer variability). 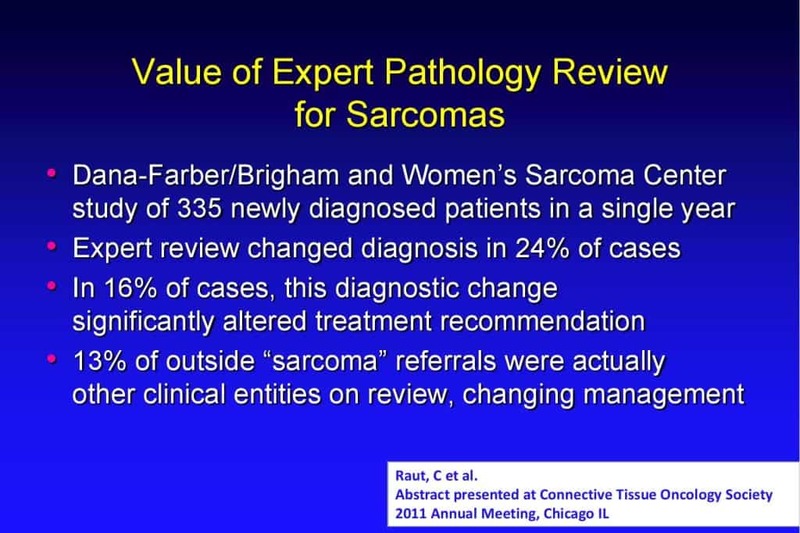 Therefore, it can be helpful to have the same radiologist review each scan from the same patient if feasible. Even the same radiologist can sometimes measure the same tumor differently (intra-observer variability), particularly if the patient’s extremity is positioned slightly differently on each scan. Therefore, the radiologist must be meticulous when comparing the same tumor on different scans, making sure to distinguish the edges of the tumor from adjacent normal tissue and to measure the tumor using similar axes. MRI is the preferred modality for imaging extra-abdominal desmoid tumors, while CT is generally preferred for intra-abdominal desmoid tumors, with some exceptions. Patients should try to have their scans read by radiologists with experience reading desmoid tumors, so that subtle changes in size and T2 signal will be adequately evaluated. Vandevenne et al. Eur. Radiol. 7; 1013-1019; 1997. Sundaram et al. AJR 148; 1247-1250; 1987. Lee et al. AJR 2006; 186: 247-254. Radiation Exposure in X-ray and CT Examinations: 2010; Radiology Info.org. Oak, Radiology Society of North America. Can desmoid tumor recurrence be predicted? What is the significance of S45F and T41A mutations in desmoid tumors? What is the molecular nature of desmoid tumors? Read “Molecular Insights Into Desmoid Tumors” by Nam Bui and Shivaani Kummar.